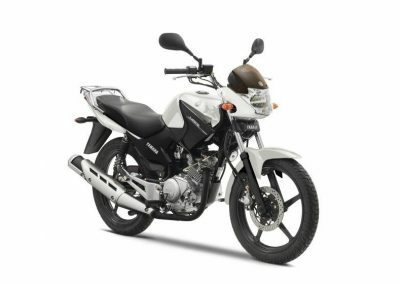 RoadTrip offers a choice of two Yamaha 125cc motorbike from our fleet. Many people are now taking up motorcycling as a hobby and as a way to beat the traffic in urban areas like London. These bikes are also a good general run-around for someone needing transport for a week or so. They have a chrome luggage rack for light loads. The YBR125 is Yamaha’s standard small motorcycle. It has a well-engineered chassis and suspension and handles and rides well. The air cooled engine does its job with little fuss and is very economical. The seat is comfortable and low so it is easy to get on and to control. The five speed gearbox also works well. This is an ideal small machine for city riding and for new riders to spend some time practising on before moving on to greater things. The YBR125 is an ideal 125cc motorcycle to hire for new riders with a CBT certificate. Why not hire a YBR 125 to practice you riding and road craft before moving on to take the Direct Access tests? Our Yamaha YBR 125s are available with “L” plates and if you need it we can also provide clothing and a helmet too. Available in Red or White. * Deposit taken as a pre-authorisation against a credit or debit card at the time of hire. A pre-authorisation is not a payment. We are able to provide you with a helmet and full protective clothing if needed – see our riding gear page. Brakes – front Hydraulic single disc, diameter 245mm.